We’re in the second week of the legislative session. Committees are getting up to speed on the issues they’ll be wrestling with, and priorities are being set. We’re working hard to educate lawmakers about our priorities for the year — including clean water funding, climate action, better protections from toxic chemicals, and modernizing Act 250. Catch up with our Legislative Update from last week, and read more below. In Governor Scott’s inaugural address, he expressed his commitment to protecting and restoring the state’s lakes and rivers, and lawmakers are already digging into this important issue. Our partners at the Vermont Natural Resources Council testified this week on the need for long-term clean water funding, and an improved mechanism for getting those resources to high priority projects to clean up and protect our waters. We will continue to build on this momentum as we push for meaningful action on clean water funding this year. VCV and partners are busily engaging lawmakers on our climate action plan. Click here to check out our suite of recommendations for climate action in 2019. At the State House on January 23, we’ll present and discuss our plan in greater detail as part of a coalition of 21 groups, including environmental, low-income, public health, business, and youth advocates. Highlights include creating an electric vehicle incentive for lower-income Vermonters; doubling the number of homes weatherized each year; and making our climate pollution reduction targets mandatory to ensure the state’s policies are truly achieving necessary reductions. Learn more about what’s happening on energy and climate change with our LIVEClimate Dispatch from the State House,posted every Friday of the legislative session. Click here to view this week’s Dispatch. VCV is pushing for the Legislature to revisit two bills to protect Vermonters from toxic chemicals that were passed by the Legislature last year – but were unfortunately vetoed by Governor Scott. Learn more about these bills by reading last week’s update. We’re also prioritizing a measure to ensure that all drinking water in Vermont schools is tested for toxic lead contamination. Last week, the Scott administration announced its support for funding lead testing for all schools, and getting it done within a year, which is a welcome step. Plus, VCV is advocating for several bills that regulate PFAS in drinking water, firefighting foam, and food packaging. And our partners at the Vermont Natural Resources Council testified on a PFAS hearing in the Senate Committe on Natural Resources and Energy. 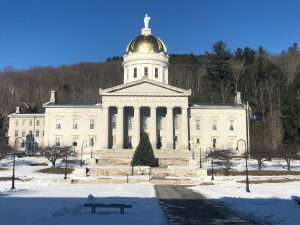 In 2019, VCV will be building on the work of a legislative commission that spent the past year and a half examining ways to modernize and improve Act 250, such as making sure it helps Vermont prevent and reduce the impacts of climate change, reduce forest fragmentation, and support our downtowns and villages. Stay tuned for more updates on our work this year to improve environmental protections under Act 250. Thank you for making your voice heard on the issues you care about. We are excited to work together to pass meaningful legislation this year to ensure clean and safe water for all Vermonters, make meaningful progress on climate change, modernize Act 250, and hold corporate polluters accountable. Stay tuned for updates each week of the legislative session, and for ways you can get involved!